We haven't heard much about it lately, but George Lucas was supposed to do a live-action "Star Wars" television series in addition to the animated one. Nothing has been heard for a while now. Hopefully he won't create anymore endearing characters like Padawan Ahsoka Tano for this. 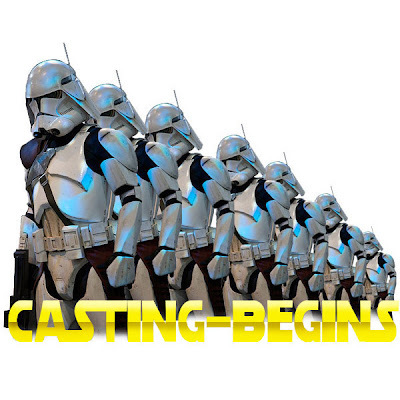 Now comes word from MTV's Movie Blog that they've started casting. I just hope that Master Lucas stays out of the day to day details with his trying to put "Red Tails" together, his experimental films, ect. and has quality people that "get" the Star Wars universe around the project. May the Force be with them. You are a comedian, Honor. Just for laughs you should change the name of your blog to Blueskywalker. So is posting Lucasfilm updates on a Disney blog EVERY week. I'll only stop when you do Honor. Take a look Mola, he doesn't post Star Wars every week. It only seems so because you obsess over it so much. Who are those cool stormtrooper clone types, Honor? I don't remember seeing any of those in the prequels. My one wish if I had my druthers would be if they cast mostly unknowns, much like the first SW movie. There's nothing more jarring than watching a SW, then suddenly there's Jimmy Smits. Jimmy Smits doesn't bother me as much as Samuel L. Jackson or Liam Neeson. It's like watching Battle of the Network Stars. I have a better name for this blog, *clears throat* I Hate Lucas. I think Dark Sky Disney is more like it. I used to think this was a blog that celebrated The Mouse but it has become nothing more than a venue to rant and has attracted immature fanboy trolls. "Indiana Jones and the Immature Fanboy Trolls". Slap a label on this one, it's ready to ship. Oh lets not forget Honor Hunter and his whiney fanboy rant, how much he hates Lucas. Hey Get A Life and to all you Anonymous' out there who defend Lucas and bash the fanboys - if you don't like the blog then STOP trolling on it. There is no gun to your head, I am sick of hearing you guys criticize everything on the board when people have a legit beef with these hack artists, the fanboys made them who they are, and you guys are just a bunch of fan whores who will blow anybody that does any spectacle film, as long as it is Star Trek, Star Wars, Indy or The Goonies, you will lick your lips and get on your knees - this blog would be better if you guys just would shut the f*** up and grow the f*** up. It's just me who craps on this site, it's not a whole group. The reason that I get pissed off when I hear people dissing on Lucas because it's rediculous. It's like they are whiney fan boys! They get pissed because Star Wars isn't treated like Predator or an Alien movie or a Terminator movie. For years people stopped being fans of Star Wars because they thought it was juvenile, and ended up being fans of those movies that I've stated above. Then Goerge makes his new Star Wars movies and they dis them when they are no longer fans of his movies. Hey all of you guys go watch your Watchemen where people are inherently evil and all violence is justified. P.S By getting rid of all childish things means you are grown up, or being cynical too. In truth you should never grow up, cynicism is hopelessness. I learned the opposite from uncle Walt. Oh and lets not forget those that don't like the new Star Wars films because they think they are juvinile. To me they sound juvenile. Let me explain. The macho bs in men is immaturity. Real men are gentle hence the title gentlemen. Not violence is cool, and the inner child should be dead! I'm sick of people thinking the movie full of negativity and cynicism are good!! !